Precisa HM With the series 390, you can enter the 390 Club with the HM. 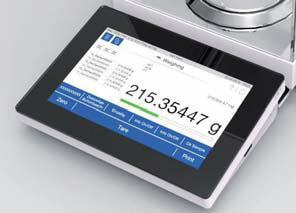 With models you get the most important features and functionalities as well as the option to personalize The 390 HM, with manual draft shield opening is the economic version with the same measurement technology as the sister models HF Precisa HF If you want to be prepared for all weighing challenges, choose the model HF. The top of the range, with all Precisa’s High-End technologies. They have touchless sensors which are programmed with different functions including contactless draft shield opening, tare, print and other useful functions. The various applications make daily work easier and work perfectly together with ECS and AOS. ECS and AOS ensure the most reliable weighing results under all conditions and with traceability. Weighing at the peak of available technology, that’s the HF. With an easy to use menu, similar to the best smartphones, you will become familiar within seconds with your unique balance and exploit its full potential. You can build your balance with those applications and features that suit your individual needs and requirements. We have two of the four different Precisa 390 models: HF, and the HM. 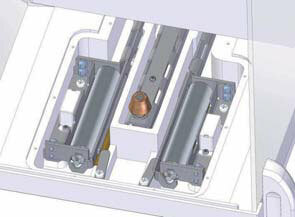 Upgrades to the 390 series balances are always available, with various options, accessories and unique Precisa applications. The draft shield windows are frameless and manufactured out of glass, offering you a barrier-free view and easier access into the weighing chamber. Removable glasses can be taken out for cleaning in seconds. Glass parts, all weighing pans and other components can be cleaned in a dishwasher. The new and brilliant balance series offers you best ergonomics, including an ultimate low weighing pan level, the lowest on the market! 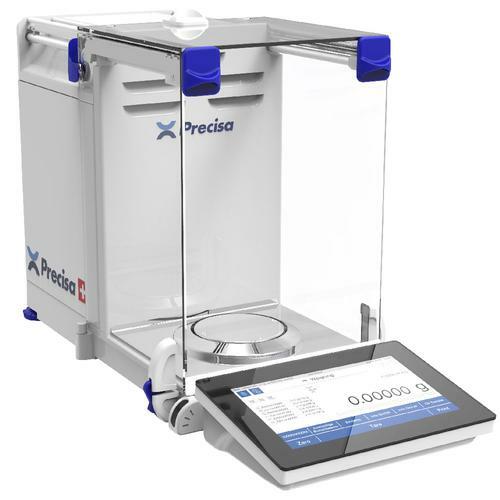 Weighing processes can now be performed more comfortably, more ergonomically and with ease. You can speed up your daily routine and help yourself perform the weighing tasks much easier by utilizing the integrated non-contact IR-sensors. Thanks to the new load cell and the state of the art signal processing, the weighing results are shown unbelievably fast and visualized with our newly developed stability indication system. The new, by default built-in electronics, as well as all the optional accessories, will amaze you for years with the ultimate weighing accuracy. The user manual is built into the balance shown on the balance display and can be recalled and read at any time. Wherever you are with your balance, the user manual is always accessible to you. The expanded the same philosophy to cover everything in the balance series. We use colour coding throughout the instrument, starting from display, interface (UI) and mechanical components, that you know without hesitation where to open a clip or perform a software action, how to activate a draft shield movement or how to set remote the touchscreen. All balance functions are available at your fingertips on this smart and bright colour display. According to the built-in colour logic, all the touch active surfaces – marked by a key or a selection – are drafted in blue. The balance user interface is intuitively easy to operate. The operation model took inspiration from the best smartphones as well as absorbing the most elegant features – just for you. Tap on the touch active, blue coloured button and surf with ease . There is no way to get lost because of the always available “Home” button, which takes you conveniently back to start. Want to make your life easier! The help is available at any time, whenever you need it! Just press the Help icon and you instantly have our built in user manual and relevant information available, with real context on the balance display. No more wasting time searching the lost printed manual. This was one of the topics at the hearts of our Swiss engineering team. The new door automation system is simple, yet very impressive. Electronically powered side doors with timing tuned, high-efficiency motors, ensure a gentle, smooth and precise opening to a desired position. Together with the door design, this state of the art draft shield is optimized to prevent any interference when weighing in fume hoods or ventilated laboratory rooms. The weighing chamber is designed in a way that neither powder nor liquids can contaminate the weighing system. The bottom plate is equipped with a tear-off edge preventing liquids to penetrate inside the casing. All draft shield parts, top and side glasses, weighing pan, can easily be removed without any tools and placed into your lab dishwasher. The sophisticated door design without any guide rails or channels facilitates an affordable, easy to clean construction. Is an innovative linearization and adjustment system, meaning you will always have a perfectly adjusted weighing scale at three main points, zero, 50% and 100% . The system operates automatically and detects all changes in the environment - and it can be activated manually at any time. We have naturally - to confirm the weighing accuracy - designed the mechanical system in such a way that the internal weights are protected against liquid, dust and any foreign particles. The 390 series balances promises you the best possible accuracy and precision for years to come. The new optical stability indicator provides visual indication of environment disturbances and provides real time information about the balance environment. The indicator displays how the weighing accuracy develops in your daily working environment and reduces potential uncertainties. The stability tracker display simlyl indicates to the balance user when the balance has high ambient stability and takes longer to change with greater instability. You can now - by observing the orbital symbol - intuitively quickly predict a weighing result or wait until the completion of the circle so that the weighing result is definitely fixed. A visual warning appears on the display if the instrument is tilted outside the internally stored levelling tolerances. To readjust the levelling, an electronic virtual guided levelling display will be activated and instruct you on how to get your instrument back to the correctly levelled position. Series 390 is ready to follow your communication needs whether you are already working in a paperless lab with LIMS or not. 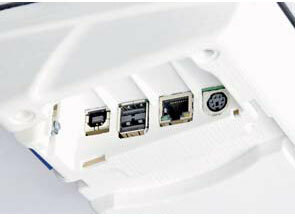 On the rear of the instrument an RS232 and USB type B interface are included. Therefore connecting your balance to a PC or RS232 printer for protocol printout is made easy. You can equip your series 390 balance with useful applications, similar to SmartPhones. Applications can be installed easily by any user with the appropriate authorization and you will not need any specialist. Your requirements today may not be the same as they may be in the future. You might need to find new working methods to make the work easier. There are affordable Precisa apps which can help you and make your life a lot easier. This exclusive feature is available from Precisa Gravimetrics only. Your balance can be set and optimized for various users by using the built-in, extensive user management system. A user profile is set just once. And when starting work with your balance, you just choose your own profile and the balance is ready for you, the way you need it, personalized with broad access rights, or just set with the basic operation facilities, like right or left handed user. Touchless Sensors are very helpful, when you perform daily routines with your balances, like opening a draft shield door, taring or zeroing the balance or performing a special function. You can set the built-in touchless sensors to activate those functions by a simple hand motion. The sensors can be adjusted with three detection angles to follow your own, personal needs and tasks. Electrostatic Cancellation System All electrostatic charges are neutralized quickly by our built-in AC pulse technique utilizing ion neutralizing system, which is engineered and manufactured together with Panasonic. Operation is easy. Just by placing the sample into the weighing chamber, your sample is automatically neutralised when the draft shield is closed. No laborious search for an externally installed ionizer. Retrofit installation of an ECS is possible by a local Precisa engineer. Ambient Observation System Various ambient air conditions affect the weighing result. Therefore meteorological factors such as air pressure, air humidity and air temperature are recorded with AOS. This is done in real time and inside the weighing chamber where the sample is placed. This important parameter supports the traceability and can also provide an indication of the ambient status. The information can be recorded, used just as an indication or as an additional parameter when calculating the weighing result with the app BEST. 3.15 inch Dia. - 80 mm Dia.